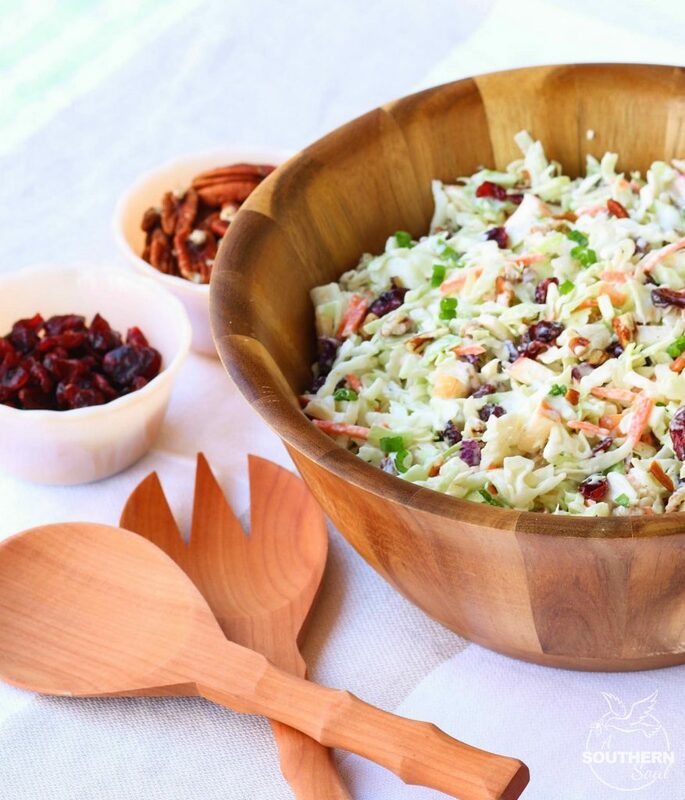 Take your coleslaw to a whole new level with sweet, tangy cranberries and crunchy pecans. Mix in an apple and some savory, green onions then toss them all in a creamy dressing for a dish that will be a favorite at any gathering! 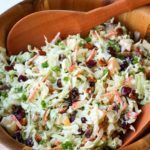 For years I’ve loved this crunchy slaw. I’ve eaten it at church gatherings, covered dish suppers, picnics and cookouts. I’ve also seen it on many restaurant menus. I think the reason it’s shown up in so many places for so many years is because it just so stinking good! It’s fruity, sweet, tart and crunchy. It’s one dish that has just the right amount of each of those important elements for a burst of flavor in every bite. Now, I have to share a little “funny” with you. 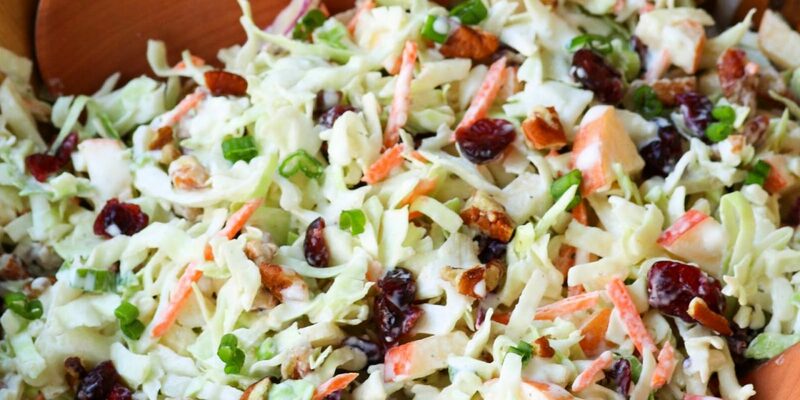 As much as I love and rave about this slaw, I’ve never made it. I think somehow or another, the whole notion of making for myself just escaped me. So, over the weekend, I decided to change all of that and come up with my own version. I thought a bit about the different versions of the recipe I’d had over the years and came up with a short list of my favorite ingredients. 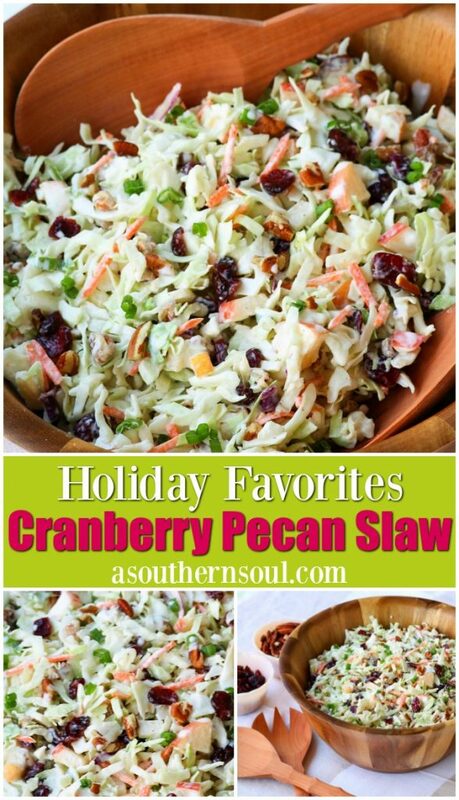 To a “bagged” slaw mix, I added dried cranberries, an apple, chopped pecans and green onions. Now, how easy was that? Next, all that was needed was to make a creamy dressing with just the right mix of flavors. 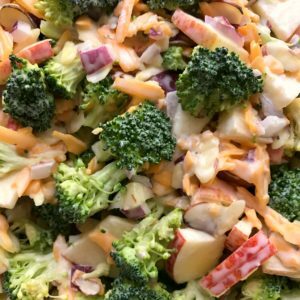 My inspiration for the dressing came from my Broccoli Apple Salad recipe. I mixed up sour cream, mayonnaise, vinegar and honey then sprinkled in some salt and pepper. I poured that heavenly dressing over my slaw mixture, gave it a good toss then went in for a taste test. Yep…that was it, all of those magical flavors blended together beautifully to make one special bite. This was a lesson learned. 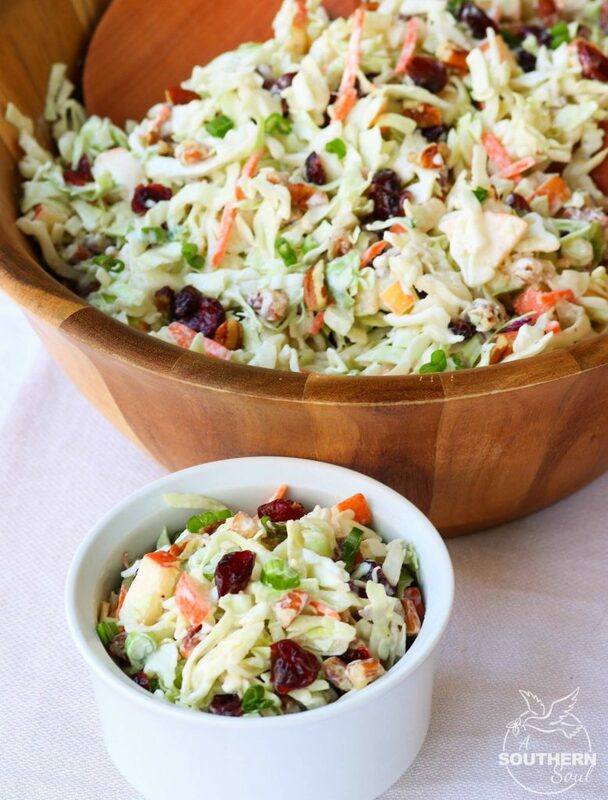 When you like something, even if it’s a yummy slaw recipe, give it a go and make it yourself in your own special way! Go for it…you’ve got this. In a small bowl, add mayonnaise, sour cream, vinegar, honey, salt and pepper. Whisk together until smooth. 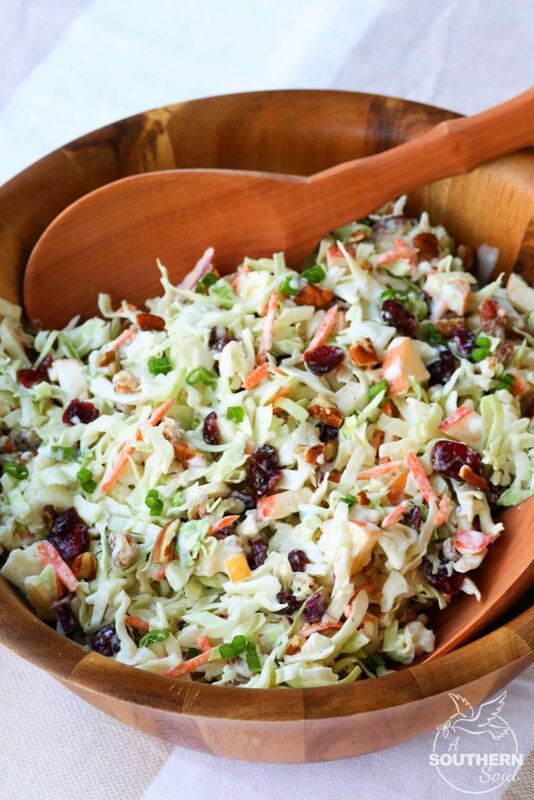 Pour 3/4 of dressing over slaw and toss until mixed well. Add remaining dressing if desired. 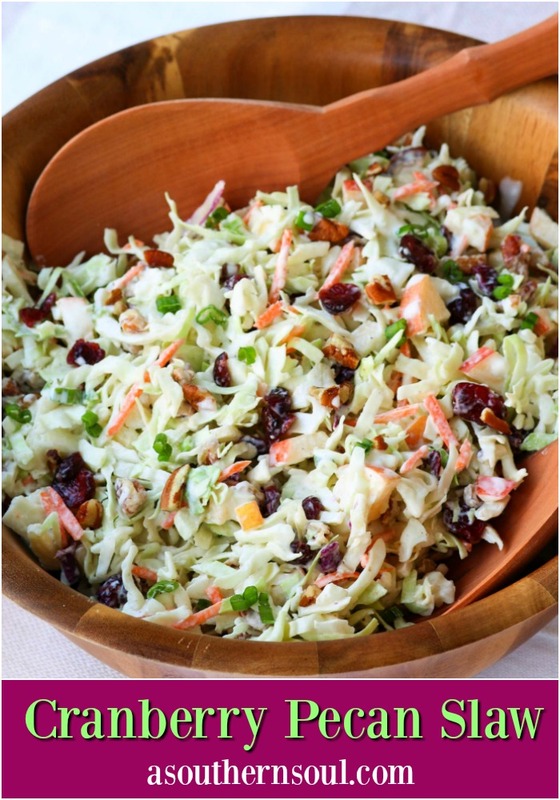 **Additional dressing can be saved in a sealed container to add to slaw at a later time or before serving. Serve immediately. 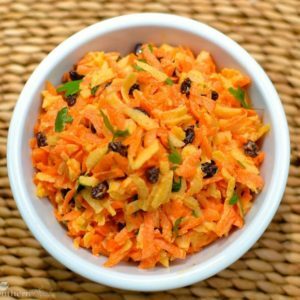 Slaw can be stored, covered in the refrigerator until ready to serve. Toss slightly and add saved dressing if needed. Don’t forget to PIN this recipe to save and to FOLLOW on Pinterest for more great recipes! Pam you have made my day! Thank you so much for your kind words. I hope y’all enjoy the cranberry slaw. Merry Christmas to you and everyone in your family! 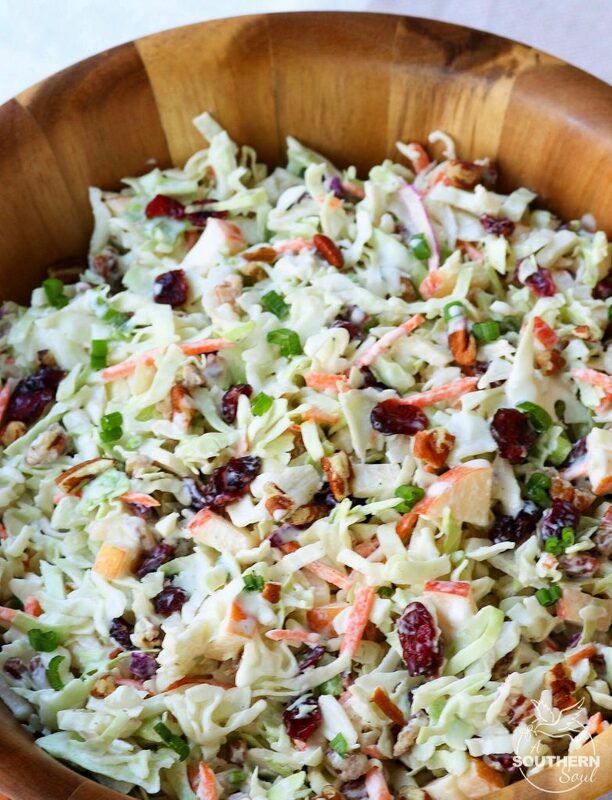 PS – send me pics when you make your slaw! 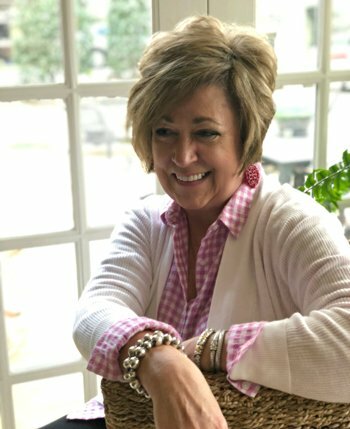 Thank you so much for sharing, June! You’ve made my day and I’m tickled your grand daughter like it. I too was inspired by the pictures. I used avocado oil mayo (Chosen Foods) and plain unsweetened non-dairy yogurt (Kite Hill) and you’d never know I’d substituted anything. It was delicious. 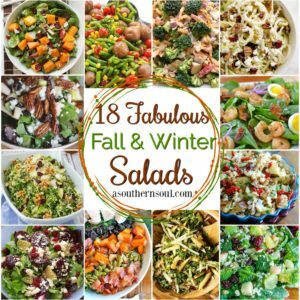 Will become my go-to salad to have with BBQ! Thanks for posting. 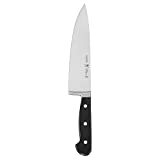 Do you need to put anything on the chopped apple to keep the pieces from turning brown? Can’t wait to try this salad! Hey Amy. You don’t need to do a thing to the apples. Just make the salad per the recipe. I hope you love it! Please let me know. Love how easy this is to make! Such a delicious side! Looks like a new favorite side dish in my house! Hi , can I make this a few hours ahead including dressing it and just stir and add pecans when serving ? Pat, you sure can. The slaw actually gets better if it sits in the dressing for a bit.